A century ago, we didn’t know the size of the universe. We didn’t even know the size of our galaxy. In 1838, Friedrich Bessel made a breakthrough in determining stellar distances by measuring the parallax of a star for the first time. While this gave us the distances to many nearby stars, it wasn’t effective beyond a few hundred light years. 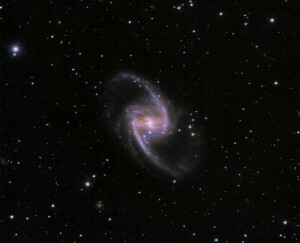 Even now parallax is only useful to about 1,600 light years. This is a small fraction of our galaxy, much less other galaxies and beyond. But in the late 1800s, studies of dense, spherical clusters of stars known as globular clusters found something interesting. Most of the stars in a cluster had a constant brightness, but some (known as RR Lyrae variables) would periodically brighten quickly then slowly fade. They all have a fairly regular period of about half a day, and they all seemed to peak at about the same apparent brightness. 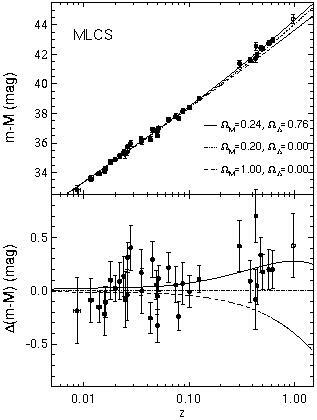 Since stars in a globular cluster are all about the same distance away, this meant that RR Lyrae variables must have a uniform maximum brightness. By comparing the brightness of the variables in different clusters, we could then determine just how far away these clusters are. 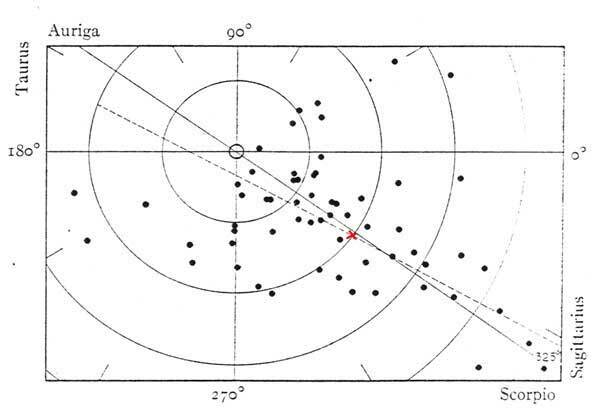 Shapley’s map of the galaxy with the Sun’s position indicated in red. In 1918, Harlow Shapley used these variable stars to determine the direction and distance of globular clusters as a way to determine the position of the Sun within the Milky Way. Shapley argued that globular clusters should orbit the gravitational center of the galaxy. By studying the distribution of globular clusters we should be able to determine the size and shape of our galaxy. 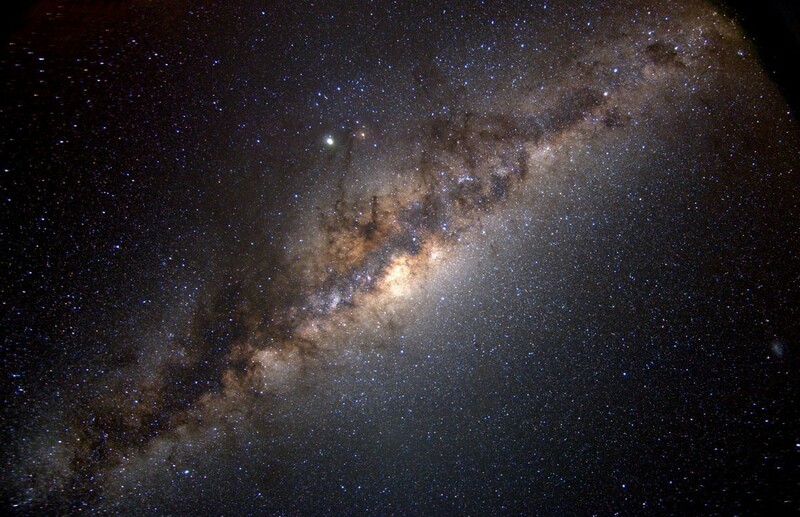 He found the Milky Way was roughly pancake shaped, with a diameter of perhaps 150,000 light years, and he placed the Sun about 50,000 light years from the center (we now know it is about 27,000 light years). Shapley showed not only that the Sun was not the center of the universe, but that the Milky Way was much larger than anticipated. So large that it might comprise the entirety of creation. By the 1920s there was a great debate over whether this was actually the case. Shapley felt it was, but others such as Heber Curtis thought otherwise. The debate centered on the distance to certain nebulae. At the time, “nebula” referred to anything (excluding comets) that appeared “fuzzy” rather than distinct like a star or planet. So things like the Orion nebula (a stellar nursery), the Crab nebula (a supernova remnant) were considered nebulae just as they are today, but what we now call galaxies were also known as nebulae. The Andromeda galaxy, for example, was known as the Great Andromeda Nebula. Curtis thought Andromeda was an “island universe” like the Milky Way, likely millions of light years away. Shapley thought Andromeda and other spiral nebula were close to the Milky Way. The problem was that RR Lyrae couldn’t be used to settle the dispute. While they allowed us to determine the distance to globular clusters thousands of light years away, they were relatively dim and difficult to measure. 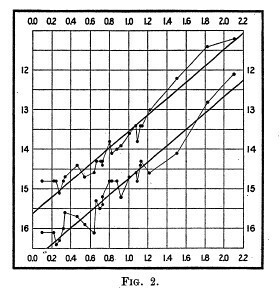 But in the early 1900s Henrietta Leavitt had found a relation between another type of variable star known as Cepheid variables. Leavitt analyzed more than 1,700 Cepheids to find that their maximum brightness could be determined by the period at which their brightness varied. It became known as the period-luminosity relation. The advantage of Cepheids is that they are much brighter, and could therefore be seen in Andromeda and other spiral nebulae. It was a major breakthrough, but it took more prominent astronomers to make the relation widely known. While Shapley began using Cepheids to better determine the distances of globular clusters, Edwin Hubble measured Cepheids in Andromeda to find that, sure enough, it was a galaxy about 2.5 million light years away. As he measured the distances to other galaxies, he began to notice a pattern. The more distant the galaxy, the greater its observed redshift. This relation became known as Hubble’s law, and it gave us another tool to determine cosmic distances. Since redshift could be measured fairly easily, Hubble’s law had the potential to measure distances across billions of light years. Hubble’s relation was not without its critics. Originally Hubble’s observations only went as far as about 8 million light years. Extrapolating the relation to a billion light years or more seemed a bit presumptuous. 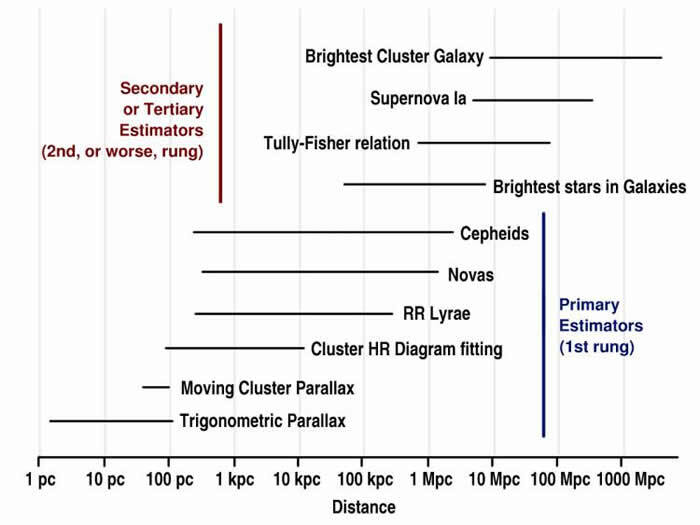 We needed another way to determine the distance of the farthest galaxies. The supernova redshift relation that discovered dark energy. 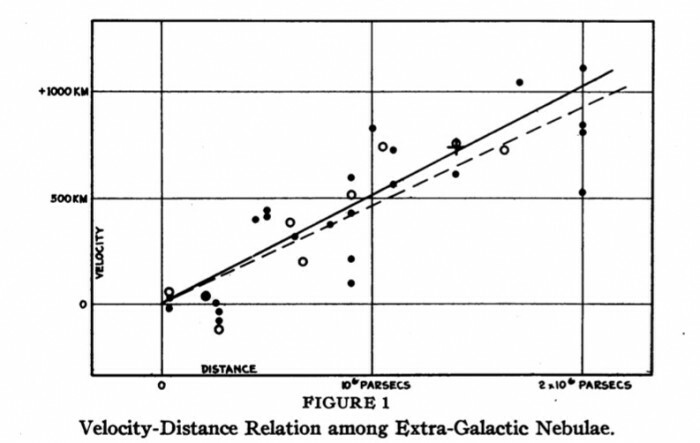 By the 1970s astronomers began to look toward supernovae as a possible solution. We had observed lots of supernovae in other galaxies by this time, and it was noticed that a particular kind of supernovae known as type Ia seemed to have a consistent maximum brightness. As such they could potentially be used as a standard candle to determine distances. By comparing a supernova’s observed brightness with its actual brightness, we could begin to measure billion light-year distances directly, rather than relying upon Hubble’s law. We found that Hubble’s relation did hold up pretty well over billions of light years, but for the most distant galaxies it didn’t hold up quite so well. In 1998 Saul Perlmutter, Brian Schmidt and Adam Riess had found that supernova distances weren’t consistent with a steadily expanding universe as Hubble’s law implied, but that the universe as a whole must be expanding at an increasing rate. This gave rise to the discovery of dark energy. Various methods of the cosmic distance ladder. At the beginning of the 20th century, we were just beginning to map out our galaxy. By the end of the 20th century we had discovered a universe billions of light years across. The methods we now use to determine cosmic distances are known as the cosmic distance ladder. While the overview I’ve given covers the main methods, it’s important to understand that they aren’t the only methods we use. We have several ways to test one method against another, so we have a good understanding of just how accurate these methods are. There are still uncertainties in any distance measurement, and the greater the distance the greater the uncertainty. There are still debates about the strengths and weaknesses of different methods, but not about the overall scale of the cosmos. In a very real sense we have climbed the ladder from ignorance to knowledge of just how large the universe actually is. Is there a more recent version of the supernova redshift curve that shows the nonlinear behaviour in more clarity? This article is a fine introduction indeed to the second question. But how big is the universe itself? Do we even have a clue whether it is finite or infinite? We know the total universe is much bigger than the observable universe, but we don’t know if it is infinite.